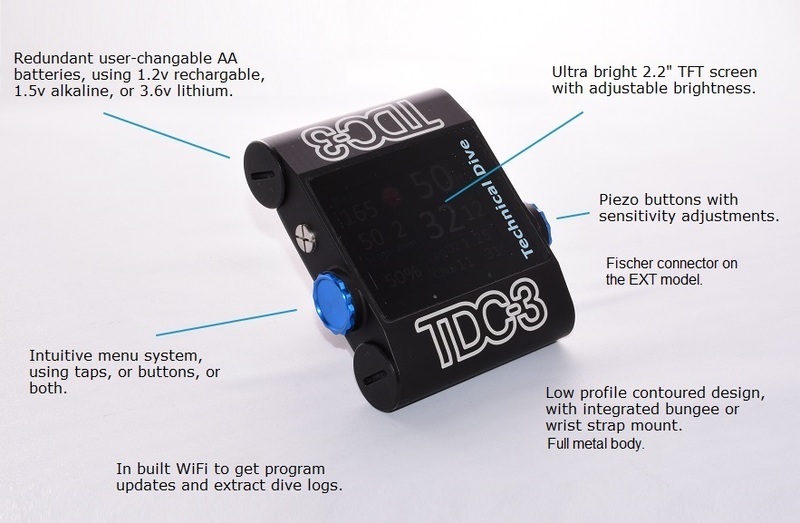 The TDC-3 is designed and manufactured to serve the most demanding divers. It runs a dive computer version of MultiDeco. Whether the plan is for a shallow warm water reef, running line in a new passage of cave, or penetrating a deep wreck, the TDC-3 provides the information divers need and the peace of mind they desire. Running the same software technical divers have come to trust on both the X1 and the DR5 dive computers, the Multi-Deco platform offers the options of V-Planner with either VPM-B and B/E or Buhlmann (ZHL-16c) with Gradient Factors. This gives the diver the ability to select which decompression model and conservatism level is right for them. An intuitive user-interface and highly-readable well organized information on the screen ensure the diver has all the tools they require. All metal alloy machined body. Download the TDC-3 user manual.